Rather than collecting dust on a Vatican shelf, the letter has continued to inspire a Washington, D.C.-based grassroots ecumenical movement for almost two decades. 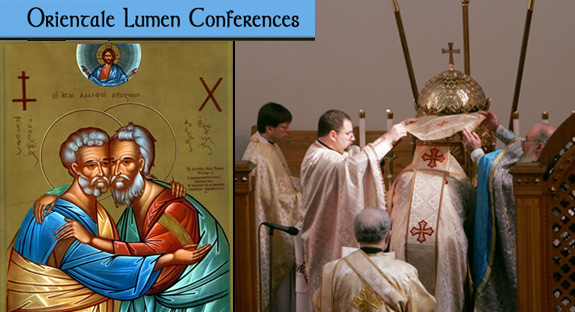 Initially planned as a single meeting to discuss John Paul’s work, the Orientale Lumen Conference has become an annual gathering open to anyone. In some ways, it has kept the light of Orthodox-Catholic dialogue burning while official dialogues have hit roadblocks. “Although you say your movement is grassroots, I’m convinced it’s rooted in heaven and inspired by the Holy Spirit,” the Ecumenical Patriarch, Bartholomew, Archbishop of Constantinople, told the apostolate on its 10thanniversary. Figel, who grew up in a Slovak family near Pittsburgh, rediscovered his Eastern Christian roots when he was in college. In the early 1990s, he met a priest in England who wanted to revive publications of the ecumenical Society of St. John Chrysostom. The result was Eastern Churches Journal. Later, when the priest, Father Serge Kelleher, and an Orthodox bishop, Vsevolod of Scopelos, wanted to reprint a liturgical book from 17thcentury Kiev, Figel started Eastern Christian Publications, which he still runs. ECP’s list includes books, DVDs and CDs on ecumenism and Eastern Christianity. In the apostolic letter, John Paul reminded Christians that “a particularly close link already binds” Catholics and Orthodox. “We have almost everything in common; and above all, we have in common the true longing for unity,” John Paul wrote. Both Churches are apostolic in origin and have a valid episcopate, priesthood and the seven sacraments. Just the things the Orientale Lumen Conferences have been doing ever since.